These skates are meant to go fast and because of their design they are very popular skates. Speed skates feature low cut shoes (boot) that fits just like tennis shoes. The low cut design helps with going around corners. 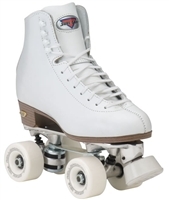 These skates are very popular because of the freedom of movement that they provide in the ankles thus being popular for jam (dance) skating and, of course, speed skating. These skates also feature speed style wheels and bearings (part that makes your wheel spin) that enables skaters to skate faster and longer. These skates are simply meant for the outdoors. 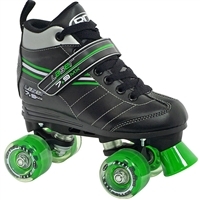 Outdoor skates come in either low top or high top boots and the wheels are specifically designed to skate outdoors where the ground is not as smooth. For the most part, the only difference between an indoor skate and an outdoor skate are the wheels. Outdoor wheels are softer and more absorbent which allow for a smoother ride over "not so smooth" surfaces. Indoor skates (sometimes referred to as Artistic Skates, Recreational Skates, or Traditional Skates). These are traditional style skates that are for those wanting to skate in a skating rink, artistically dance (kind of like ice skating but instead of a blade they have wheels), and those that want to rhythm skate. These skates feature high boots that allow for good control while performing spins or jumps. The wheels are more narrow which allow for easy turning and maneuverability. The sport of Roller Derby dates back to the 1930s and is quickly gaining in popularity. These quad skates are designed to take the abuse that is experienced by participating in the sport. Roller Derby Skates require durability but also a skate that can get up to fast levels very quickly as well as hold through tight turns. Kids skates are skates that are designed for the young skaters. They look cool but at the same time they designed so that they will not go as fast as other skates. Plus, kids skating shoes are designed for the wear and tear that kids put on their skates! 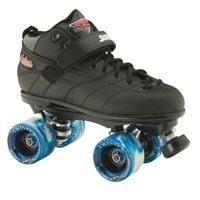 There are 3 main types of Inline roller skating shoes: Recreational, Racing, and Roller Hockey. 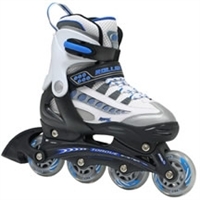 Also known as fitness skates, these recreational roller blades are designed for the skater who wants a good pair of skates to exercise in, usually outdoors. The shoes (boots) are high top which offers excellent foot and ankle support. 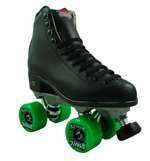 These skates are also very comfortable so that the skater can skate for longer periods of time. Racing skates are skates that were designed to go fast, simply put. The shoe (boot) is designed so that it fits as close to your foot as possible allowing you the least amount of wind resistance. The wheels of these skates are easily interchangeable to allow the skater to skate indoors or outdoors. These are skates that are made for those playing the sport of roller hockey. Roller hockey is a very popular sport, especially among youth and young adults. These skates were designed to hold up to the abuse due to the nature of the sport.